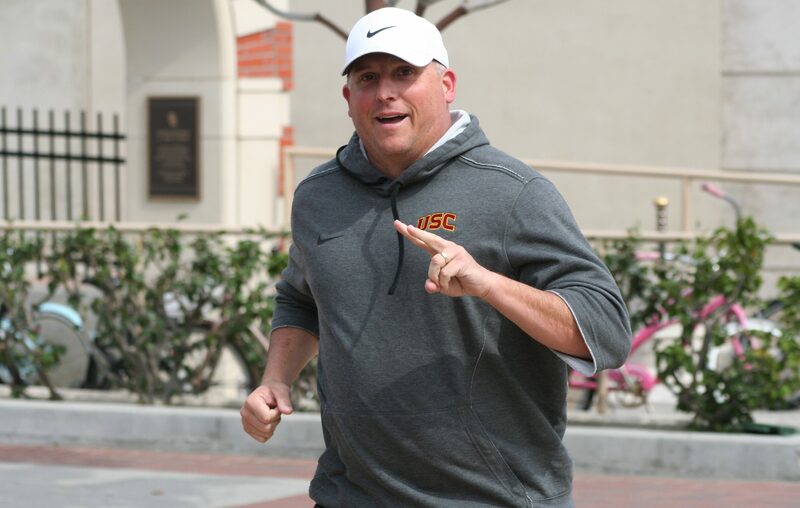 The USC Trojans put the finishing touches on spring ball 2019 with a practice that had a little bit of everything we’d seen through the first 14 practices. There was some live tackling, with another big hit from a linebacker (this one from Kana’i Mauga). There was consistently good play from the leaders at wide receiver and along the defensive line. And it was another day where the quarterbacks really didn’t separate themselves into a clear pecking order. 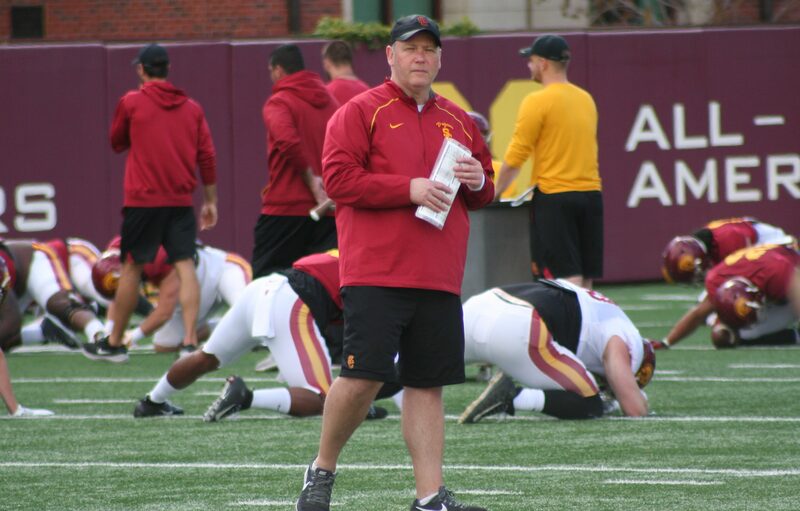 Head coach Clay Helton and the coaching staff purposely injected some real competition into this practice, as they loudly kept score during the one-on-one portion featuring the offensive linemen against the defensive linemen, as well as the wide receivers taking on the defensive backs. The offensive side of the ball won both competitions, though there were standout performances from several players. JT Daniels dropped a really nice ball over the shoulder of Amon-Ra St. Brown, who hauled it in. St. Brown had another nice day today, as he really ratchets things up when it gets competitive. Daniels also lofted a nice touchdown to Tyler Vaughns, who brought the pass in at his waist after it sailed in over his shoulder. Briton Allen had a nice pass breakup on a deep ball intended for Josh Falo. Allen has had a lot thrown at him this spring, and he appears to be taking it all in stride. He can still make some true freshmen mistakes at times, but he has gotten a ton of reps this spring and should be better off for it come summer and fall. Devon Williams had a terrific diving catch on ball from Matt Fink. Williams was a little up and down today and hasn’t been consistently dominant throughout spring the way you would have thought after that first week or so. But it was still a good spring for him and he keeps showing flashes of what he is capable of doing with that big body. Kedon Slovis hit Michael Pittman for a touchdown as Pittman used his body to shield the defender away from the ball. Pittman has really been physical against defensive backs this spring, often creating contact himself before breaking off and finding open space. Dominic Davis and Greg Johnson had back-to-back pass breakups where they went high in the endzone to knock away jump balls. Davis took his away from Williams, while Johnson’s was against Vaughns. As for the OL/DL one-on-ones, Jay Tufele continued to impress, putting together terrific reps against Justin Dedich and Andrew Vorhees. Vorhees had two nice wins against Marlon Tuipulotu and Connor Murphy, and Brett Neilon did well to hold off Drake Jackson. Jackson came back and got around Jalen McKenzie with a really nice use of his hands to slap McKenzie away and get around him. During team drills, the offense remained the same, with Austin Jackson, Alijah Vera-Tucker, Brett Neilon, Andrew Vorhees, and Jalen McKenzie along the line. JT Daniels went first among the quarterbacks today. Defensively, Christian Rector, Tufele, and Tuipulotu manned the line, with Jordan Iosefa, Palaie Gaoteote, and Hunter Echols at linebacker. Isaac Taylor-Stuart, Davis, Chase Williams, Allen, and Jordan McMillan formed the secondary for the first unit. There were two noteworthy plays early on in the series for Daniels and then when Jack Sears came in right after him. Daniels, going against the first team defense and receiving the snap inside his own endzone, had the pocket collapse on him by Rector and Tufele, and he barely got the pass away. It might have been reviewed as a potential fumble, but was ruled an incomplete pass. Just a few snaps later, Sears took the snap and quickly escaped the pocket to his left, eventually finding Falo deep down the field. It wasn’t the prettiest throw, but it got to Falo, who ultimately dropped it. Both plays went as incompletions, but it was a fairly clear illustration of what offensive coordinator Graham Harrell said about each quarterback–that Daniels can sometimes work too slowly in the offense, and that Sears is maybe more comfortable escaping the pocket quickly. Daniels, however, came right back on the next snap to hit Vaughns with a quick throw and Vaughns shook off a tackle from Davis to pick up extra yards and a first down. Greg Johnson put one of the hits of the day on John Jackson III to break up a potential first down grab. Johnson was wearing a yellow non-contact jersey, but came all the way through Jackson to not allow the completion. Markese Stepp would fumble after a reception later in the practice, but he put a nice move to get around Murphy in the backfield on a running play. Things got physical between several players, as Pittman was called for holding on a play that went wide. There was some jawing back and forth between Pittman and some defensive players and eventually punches were thrown by several players. Helton stopped practice and brought the entire team out on the field to do up-downs. Helton spoke after practice about the incident, saying that he understands there is going to be emotion when things get competitive, but it has to be intelligent emotion. With such an emphasis on discipline and avoiding penalties this spring, Helton had a really strong reaction to the personal foul penalties. We again saw the running backs as a whole show up, as Stephen Carr had a nifty move in the backfield to escape upfield. Vavae Malepeai probably had the play of the day from the group, as he broke several tackles on his way to a long touchdown run. Sears hit what I think was Pittman for a deep touchdown. The receiver was blocked by the defensive sideline. Slovis got in on the scoring with a short pass to St. Brown, who disappeared behind the defensive players on the sideline and looked headed out of bounds. There were several “Ooohs” from the offensive sideline opposite us, and then St. Brown somehow emerged into view not out of bounds or tackled. He shook another defensive back and scampered into the endzone. He was met there by several offensive players, who had come off the sideline to celebrate what was a terrific run after the catch. Mauga put the hit of the day on running back Quincy Jountti, as the linebacker blew up a screen pass and knocked the ball away with a big collision. Rector and Nick Figueroa got into the backfield to register a sack of Slovis, and then Pili followed that up with what would likely have been a sack of his own. Williams went up for a pass in the endzone against a walk-on cornerback and couldn’t come up with the jump ball. It was a play we’ve seen him make several times this spring, but again highlighted a little of the ups and downs he’s had. He came right back after that by grabbing a slant for a touchdown, where he sealed off the cornerback and made an easy play. And again, it showed just what he’s capable of, especially in the redzone. Malepeai closed things out for the offense, and for spring ball, when he scored on the final play with a run up the middle, assisted by a push from several offensive linemen. Notables in attendance: Incoming freshmen Drake London, Jason Rodriguez, and Tuasivi Nomura. Former USC linebacker Hayes Pullard. There were also a number of recruits in attendance, including LSU defensive tackle commit Jordan Berry (Narbonne). 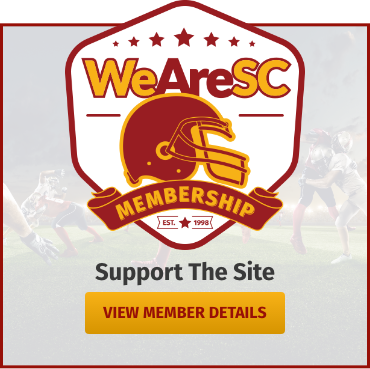 Erik McKinney began writing for WeAreSC in 2004, during his junior year at USC, covering the Trojans football team and recruiting. He then moved on to ESPN.com in 2011, where he served as the West Region recruiting reporter and then the Pac-12 recruiting reporter. 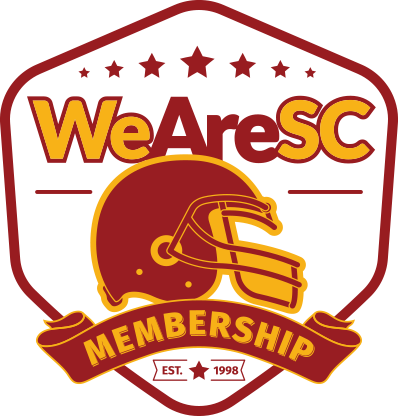 He took over as publisher of WeAreSC in January, 2019.